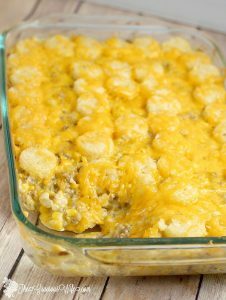 Cheesy Tater Tot Casserole is an easy dinner recipe, complete with lots of cheesy goodness, ground beef, and tater tots that your kids will love. 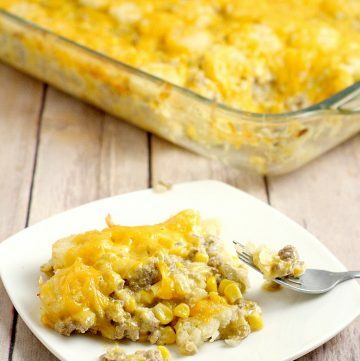 Cheesy Tater Tot Cowboy Casserole is one of my favorites. It is sooo good, and the perfect chilly-weather, belly-warming, stick-to-ribs dish. 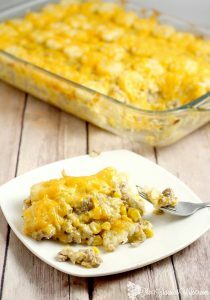 With ground beef, corn, cheese, and tater tots all coming together in this dish, side dishes become optional. I love to put a little ketchup on mine, because ketchup and tater tots? Yum! 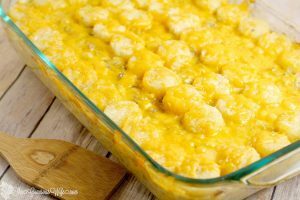 Cheesy Tater Tot Casserole is an easy dinner recipe, complete with cheesy goodness and tater tots that your kids will love. Brown ground beef with onions and garlic in a large skillet over medium-high heat. Cook until meat is cooked through. Drain and set aside. In a large mixing bowl, add cream soup, milk, and sour cream. Whisk until combined. Add corn, 1 1/2 cups of cheese, and ground beef mixture to the mixing bowl, and stir until everything is incorporated. Cover the bottom of a greased 9"x13" baking dish with tater tots. Pour your ground beef mixture over the tots. Scatter the remaining tater tots on top of the ground beef mixture. Sprinkle the remaining cheese on top. Bake in a 375° oven for 25-30 minutes, or until tater tots are golden and crunchy. 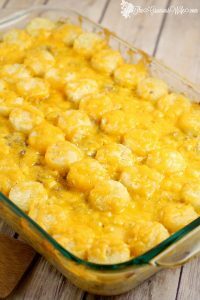 Did you like this Cheesy Tater Tot Casserole recipe? Find more on my Main Dishes board on Pinterest! Oh gosh this looks like something that my kids would adore! 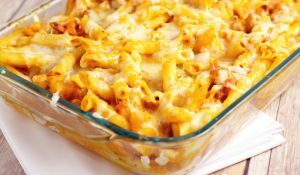 Yes please, to a big plate of this cheesy, yummy casserole! My mouth is watering! 🙂 I would love for you to share this over at my new link party Making Memories Mondays going on now! This looks so cheesy & delicious! 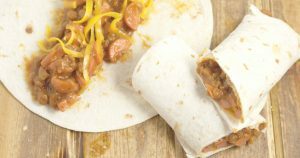 Thanks so much for sharing your yummy recipe on the Monday Funday Party! did a few changes add 2 large chicken breast [in stead of ground beef] saute it with garlic and onion, used mushroom soup and added 1 cup freeze dried broccoli my daycare children loved it. Yum! That DOES sound delicious! Glad you enjoyed it! 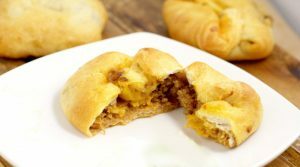 I used this recipe to use up of leftover meatloaf. I didn’t have any regular tater tots, so I subbed sweet potato tater tots. It was fantastic. Will definitely make this again.